Chris Cotter apologized on the air within hours. Normally College GameDay guests range from fun to harmless to mildly annoying. 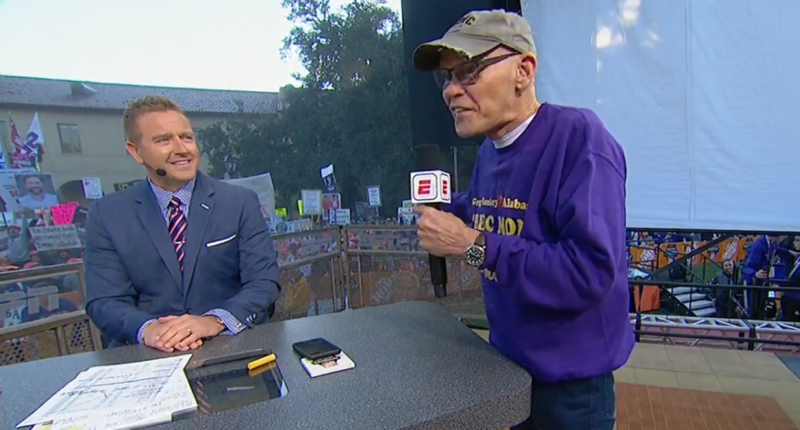 Today, with the show in Baton Rouge ahead of tonight’s marquee Alabama-LSU contest, LSU alum James Carville found a new lane: so crazy ESPN is forced to issue an on-air apology later in the day. Davis had to know what was coming, given the invitation and the fact that Carville’s stance was on record two weeks ago via an op-ed in the Baton Rouge Advocate. ESPN, of course, does plenty of business with the SEC, and even if they didn’t, having Carville voicing the idea that the playing field isn’t level (well, not level in a way we haven’t come to accept as a given) wasn’t a great look. When it comes to GameDay guests going forward, maybe ESPN can find a solid middle ground between James Carville and The Chainsmokers.